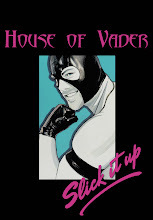 Click on SLICK IT UP for new gear at a discount using coupon code "houseofvader"
I see where you going with this photoshoot but did you consider a more subtle approach? Something more like how Clark Kent would have his Superman tights under his suit? It could be spiced up with your exec in various states of dress and undress.